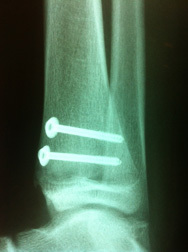 Salter-Harris II fractures are the most common growth plate injuries. The mechanism is shearing and avulsion. As a child matures, the growth plate becomes more stable. 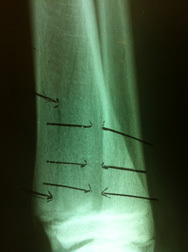 The propagating force travels through the growth plate until it is redirected into the metaphyseal bone. This results in a portion of the metaphysic being avulsed with the epiphysis. The fragment is called a Thurston-Holland sign. Spontaneous reduction frequently occurs. If the metaphysic is fractured into two or more parts, the communication makes the fracture unstable and difficult to reduce. The risk of premature closure of distal tibial fractures is much greater than previously realized because of gapping or rotation. Below is an example of a Salter II injury to the distal fibular epiphysis in a CT study.